The First World War saw the re-emergence of a form of military technology that had been around for centuries, but fallen out of fashion in the 200 years prior to the war; the helmet. Protective headwear, as well as body armour, was no longer useful after the introduction of firearms, most armour could not adequately protect its wearer from a gunshot wound without being too heavy for normal mobility, and by the middle of the 18th century had largely disappeared from the battlefield. Soldiers going into the front lines in 1914 as part of the British or colonial forces were not initially provided with helmets, and even the famous German pickelhaube was more decorative than functional. However, like many other decisions that had to be re-thought after the first year of the war, it was later decided to introduce some sort of helmet to the front line members of the British Army. This decision was largely taken as the result of the tremendous number of head wounds, usually from shrapnel, which were causing a tremendous leakage of troops into field hospitals. Injuries from shrapnel during the war were extremely numerous, much more than the previous 19th century conflicts, simply as a result of the extreme number of shells used in what essentially became an artillery war. Shrapnel wounds were difficult to treat since they did not enter or exit cleanly, and caused massive amounts of damage to soft tissues. Where a bullet wound might leave only a small healed scar, shrapnel could shred an entire limb, leaving its victim permanently damaged if not dead from shock. 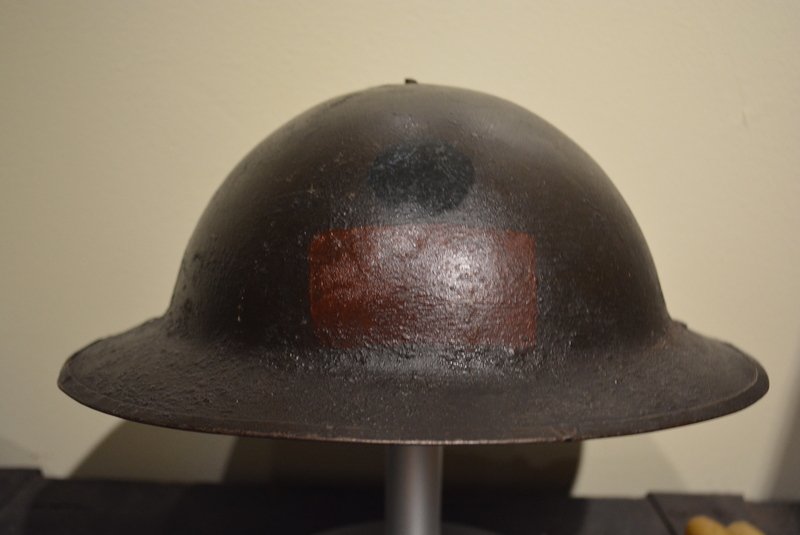 Though a steel helmet would not protect from a direct shot, it did prevent wounds from the fragments that were continually whizzing around the trench environment. The Canadian Corps used the same helmet issued to all British and dominion, the Mark I helmet. The helmet was patented late in the summer of 1915 and originally named after its inventor John Leoplod Brodie, and by the fall of 1915, the first Brodie’s Steel Helmets were provided to Canadian soldiers in the front lines only. They were initially treated as part of official trench stores, meaning that like shovels they belonged to the brigade and not to individual wearing them. As units were rotated out of the line, they had to turn in their helmets for the use of the next unit. By 1916, helmets were provided to all soldiers of the Corps and could be worn whenever needed. Like the German stahlhelm, the bowl shaped helmet became a ubiquitous identification marker of the British and Dominion armies. The Brodie helmet was designed for easy factory production and required only a single “punch” motion to turn a piece of flat steel into the shape needed. Each was outfitted with a lightly padded oil-cloth harness and a leather chin-strap to keep it in place. The earliest version had no extra rim around the edge, but by 1916 the Mk 1, which served as the model throughout the rest of the war, included a small non-magnetic rim. Helmets were usually camouflaged at the front with pant and sand to remove their fresh paint shine and by 1918 the Canadian Corps also had distinctive divisional patches added to them. Like those worn on the sleeve, the patch on a helmet helped to identify the wearer and their role within the division. Though I have yet to find numerical evidence (and probably won’t knowing hundred year old record keeping), it is likely that the Mark I, and other military helmets like it, saved thousands of lives during the First World War. *Note: Roger V. Lucy’s Tin Lids: Canadian Combat Helmets provides an excellent breakdown of the parts of the Brodie and the Mk 1 helmet.